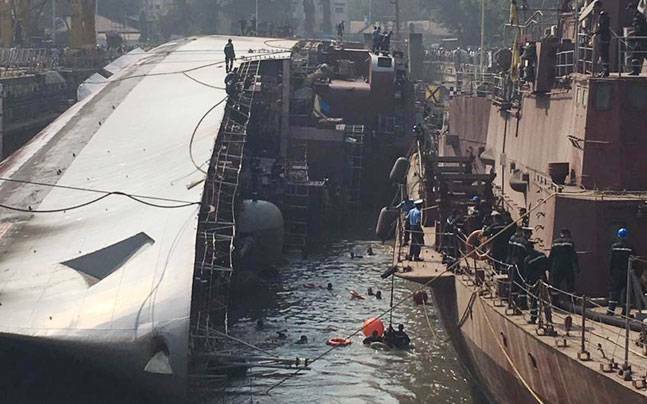 Indian Navy's 3850-ton guided missile frigate INS Betwa (F-39), which got tilted and fell on the side on December 5, 2016, at Mumbai Dockyard, while undocking, killing 2 sailors was resurrected today upright and afloat on even keel. It has been done at an approximate cost of Rs 20 crore. She will become operational in April this year. INS Betwa, a P-16A Class frigate has been made upright by the unstinted efforts put in by the Naval Dockyard, Mumbai and the salvage firm M/s Resolve Marine, specially contracted for the operation. It may be recalled that, the ship which was undergoing major repairs, had keeled on to her side during her undocking on 05 Dec 2016. The salvage operations were progressed on a war footing and the initial stabilisation of the ship was achieved by 29 Dec 2016. The complete salvage operation involving complex hydrodynamic calculations and rigging up of intricate measuring and monitoring systems was completed in less than two months. As the ship was undergoing major refit and mid-life up-gradation since Apr 2016, majority of the equipment/ machinery had already been removed for routine servicing/ replacement with upgraded equipment. Indian Navy is confident that with in-house expertise and sustained efforts, the ship will be made fully operational by her scheduled date of refit completion i.e by Apr 2018.